Ricoh Caplio R4 digital camera specifications features 7.1x optical wide zoom (28mm [Wide Angle] – 200mm [Tele Zoom] in 35mm equiv), CCD Shift Vibration Correction image stabilization function, 6.04 megapixel CCD, 2.5-inch (153,000 Pixels) LCD screen, 0.007 Sec. shutter release time lag, macro as close as 1cm, skew correction function and measures a pocketable 95 x 53 x 26 m. Caplio R4 is available in black, silver, brown and mystic blue colors. ComputerAct!ve (link dead) reviews Ricoh Caplio R4 digital camera and concludes with rating of 4 out of 5 that this is a decent general purpose camera with an excellent lens and a very good macro mode, but the level of noise on the pictures perhaps make it more suitable for outdoor pictures than anything else. Digital Lifestyles rates the digital camera overall score of 84% and concludes that “the mid-range digital compact market is already saturated with some heavyweight contenders, but we feel the Ricoh’s compelling feature set, image stabilization and enormous lens makes it a camera worthy of anyone’s shortlist. DigiCamReview gives an above average comment that Ricoh Caplio R4 is a minor update to the Ricoh Caplio R3, with a higher resolution 6 megapixel sensor, a higher resolution screen, and longer battery life. I suspect that there have been more improvements made in the background as the camera seems quicker in operation, and I’ve been more impressed with image quality this time, particularly with the rich colors and good exposure. 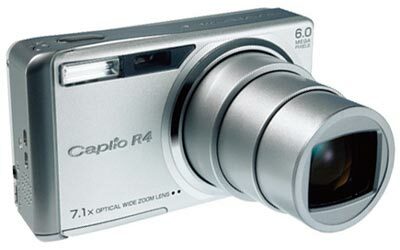 The Ricoh Caplio R4 is a stylish digital camera with a wide angle 7.1x optical zoom lens packed into a very compact metal body. The 6 megapixel camera features a 2.5″ screen and built in vibration correction – this helps produce blur free photos in low light or at full zoom. When using the camera you do need to be careful that ISO isn’t set to AUTO, otherwise you’ll end up with high noise in photos, but if you can manage to stick to ISO64 or IS100 then you should end up with some great photos – despite the camera having more megapixels – noise doesn’t seem higher than the R3. If having a lot of zoom power in a very compact camera is a priority then this is definitely worth considering. Ricoh are to be commended for innovation in providing such a large amount of zoom with image stabilization in such a small and speedy camera. The Ricoh Caplio R4 is well worth considering as there are very few alternate digital cameras that offer so much, at such a competitive price.